One of the most beautiful parts of the human body is eyes. They let us explore all the beauty present in the world. It makes us aware of all the phenomenon and changes taking place in the universe. It makes us distinguish between colors, size, shape, variety etc. An eye is a complex optical system which collects light from all around the environment by regulating the intensity through the diaphragm, focusses through a set of lenses and form an image on the retina of the eye for the vision. This is the reason that we cannot take our eyes for granted. In order to make it healthy, it is necessary to opt for some healthy diet and reduce the risk of developing certain eye conditions. If you include food items that are rich in vitamins, nutrients, minerals known as antioxidants, you can prevent various eye conditions. It is necessary for a person to take a balanced diet that consists adequate amount of protein, nutrients, vitamin in a meal. Incorporating multi-colored food into your diet might help you in getting healthy eyes. Fish: It is considered as one of the extremely good food items for healthy eyes. Fleshy fish is a great source of Omega-3 fatty acids that help in making the blood vessels of eyes stronger and healthier. It helps prevent dry eyes and improves the vision. You can get salmon, tuna, trout where you get an adequate amount of omega-3 fatty acids. It protects the eyes from glaucoma. Low level of the acid is linked to dry eyes. This is the reason it is necessary to incorporate fish into your diet. It is recommended to buy a wild-caught version of fish instead of getting it from the market as they have less amount of fatty acids as compared to wild-caught ones. It must be grilled or broiled and seasoned with fresh herbs and lemons. Almonds: They are a great source of Vitamin E. This vitamin guards our eyes against foreign harmful molecules that target healthy eyes. Regular consumption of almonds helps in preventing eyes develop cataract problem as well as age-related macular degeneration. Zinc is also present in eggs that helps the body utilize the lutein from the yolk. It helps the harmful blue eyes from damaging the retina. Carrots: It contains Vitamin A and carotene that protects the surface of the eye and prevent eye infections and other eye problems. They are easy to eat. Simply dicing them and including them in salads is sufficient. They are responsible for promoting eye health and vision. Eggs: One of the great food for eye health.The yellow part called yolk contains vitamin A, lutein, zinc which is all important for healthy eyes. 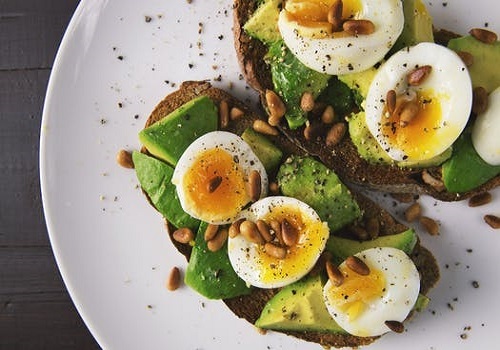 Lutein in eggs helps eyes to prevent from serious eye-related conditions like cataracts whereas zinc is responsible for maintaining the health of the retina. It also helps eyes to see clearly at night. Eggs are so versatile that you can incorporate them into all the three meals of the day be it breakfast, lunch or dinner. Green Leafy Vegetables: Some of the leafy green vegetables like kale, spinach etc are rich in Vitamin C and E and help greatly in protecting eyes from any kind of harm. Kale is usually considered superfood as it contains so many vitamins, nutrients, and minerals. It has antioxidants that help to prevent serious conditions related to eyes. Leafy vegetables also lower the risk of long-term eye diseases. These food items are extremely important and must be incorporated into the diet if you also want your eyes to be healthy and free of any medical conditions.